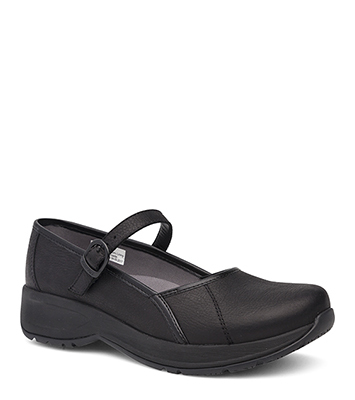 The Dansko Black Tumbled Pull Up from the Steffi collection. Classic clog meets a sporty Mary Jane in this practical hybrid?the Steffi. Stain-resistant uppers are paired with a supportive footbed with Dansko Natural Arch technology and slip-resistant rubber outsoles suitable for dry, wet, and oily/wet surfaces.